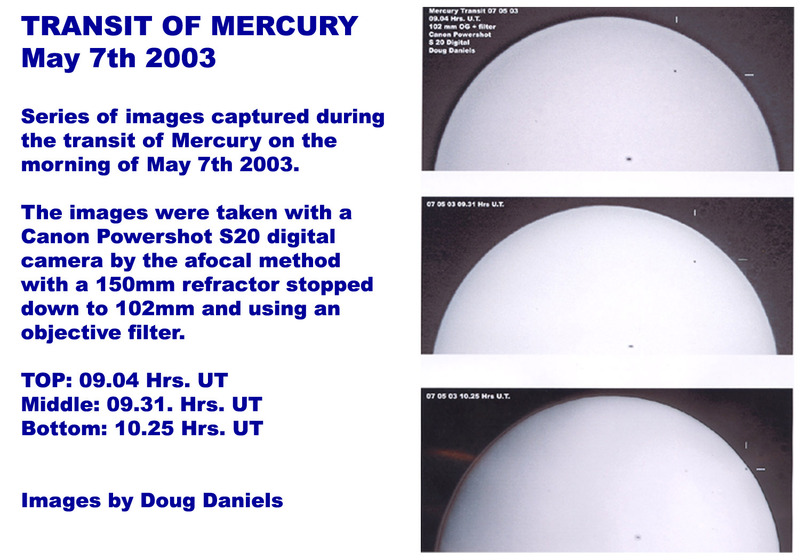 On the morning of May 7th 2003, the planet Mercury transitted the Sun. This was an early morning event as ingress took place at 05 hrs 12 mins 53 secs and the event ended with egress at 10 hrs 31 mins 42 secs. Simon Lang kindly volunteered to open the Society�s Observatory for those members who fancied an early morning session and several took advantage of it. For once the sky was actually clear and I managed to secure several good digital images with my 150 mm helios refractor. This was equipped with a 102 mm objective filter produced by Terry Pearce. The early part of the transit was however, ruined by aircraft contrails, several of which criss crossed the Sun and persisted for a very long time. The increase in air traffic in the London skies is providing yet another form of pollution which we now have to suffer!